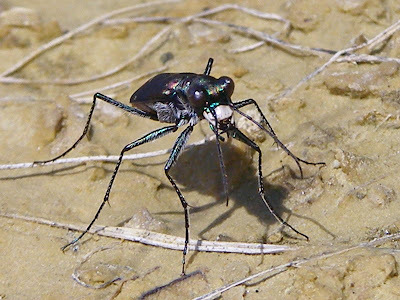 I’ve been reading about Tiger Beetles over on Beetles in the Bush and am now actively searching for these interesting creatures at Blue Jay Barrens. 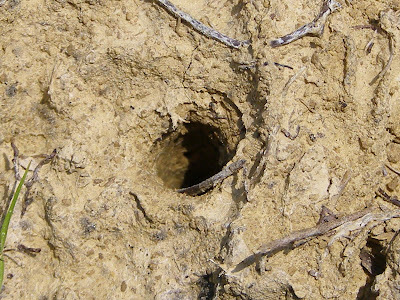 According to The Tiger Beetles of Ohio, there are seven species that I am likely to find here. This is the Eastern Red-Bellied Tiger Beetle, Cicindela rufiventris, a common species in Southern Ohio. I found this species in a small patch of bare ground along a steep bank. Dozens of beetles scattered before me as I walked into this area. 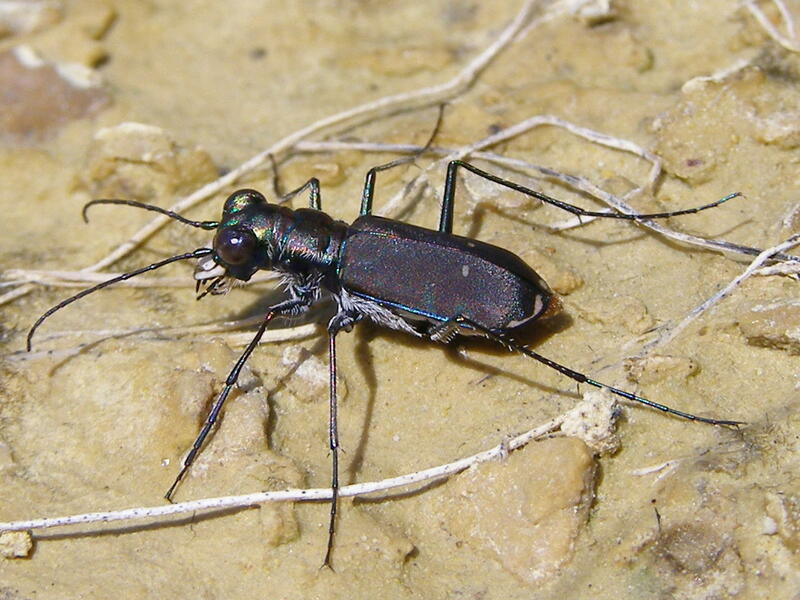 As with other groups of organisms, there are species of tiger beetles that disperse readily to take advantage of newly created habitat and there are those that are tied to a specific type of habitat and do not readily colonize new locations. Species of the latter type are usually on the list of rarities. 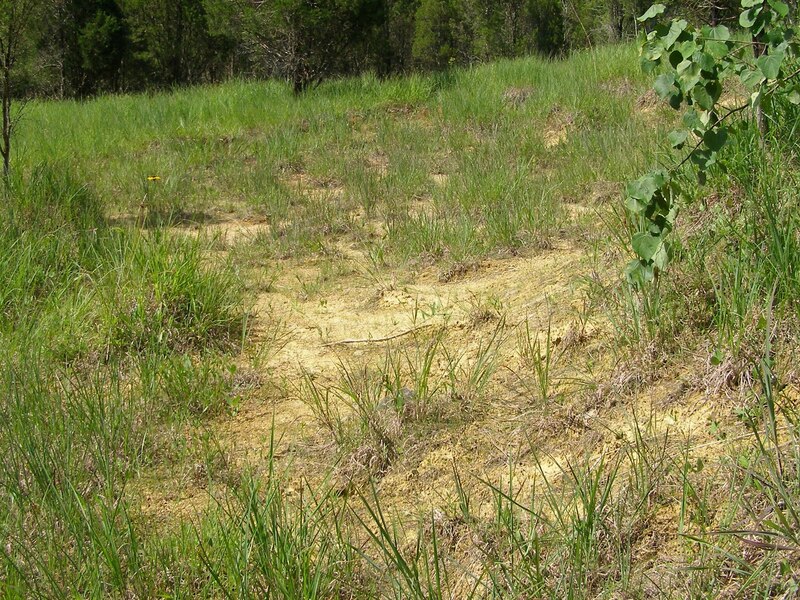 Finding these rare species is supportive evidence of the historic presence of the habitat you see on the site today. Tiger Beetles are predators that actively pursue their prey. These were actively running around, grabbing some type of tiny insects off of the bare ground. It wasn’t necessary to go chasing after these guys to get within camera range. I just crouched in one spot and waited for them to come by. Sometimes I used my walking stick to herd them my way. 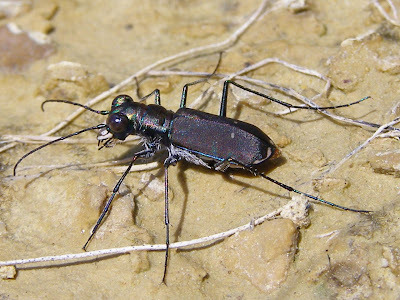 The text describes this as an easy Tiger Beetle to approach and my experience supports that. 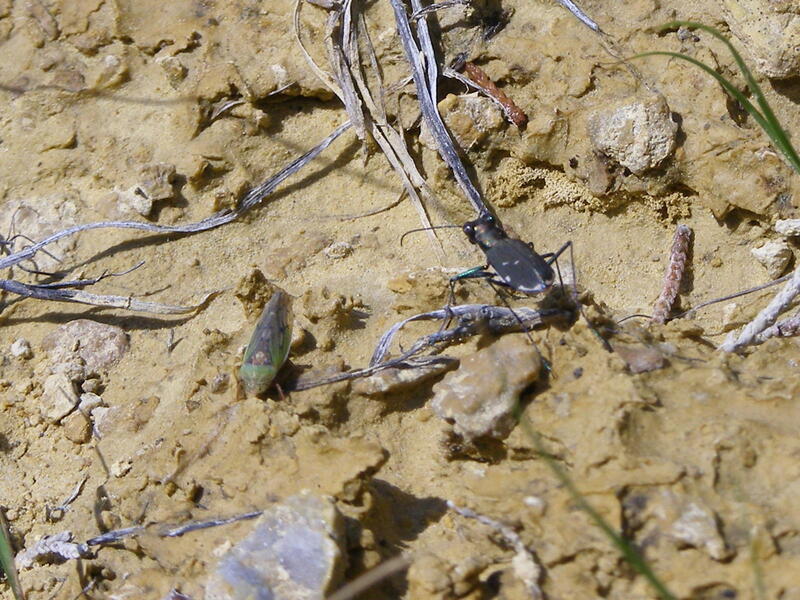 Of course, I haven’t had a lot of experience in stalking Tiger Beetles, so I don’t have much basis for comparison. There is a lot of similarity between species in the basic pattern of markings on the back of the Tiger Beetles. In some species, such as this one, individual patterning can be quite variable. By looking at the individual markings, I could easily have imagined several species of Tiger Beetles running around in front of me. The defining character in this case is the reddish abdomen that can be seen just below the wing coverings. I kept waiting for this beetle to attack the leafhopper, but it never even seemed aware of the leafhoppers presence. I wonder if there is a factor in the beetle’s instinctive prey image that makes it disregard anything in excess of a certain size. 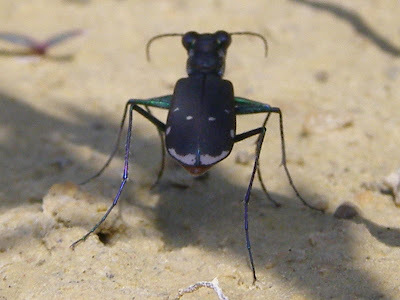 What I would really like to see is a Tiger Beetle larva. I’ve seen pictures and preserved specimens, but I’ve never encountered a live larva. I saw several holes that seemed the proper size for larva burrows, but saw no larval activity. This species is described as normally having a one year life cycle, so I suppose, given the abundance of adults, this is not the time of year to be looking for larvae. Nice find, and very nice photos. You've done a great job describing some of the more interesting aspects of this species and tigers in general. Also, the leafhopper is probably too big a prey item. They're not as picky about the type of prey as the size, so something smaller like an ant or small spider would've probably elicited an attack. Once you get an individual comfortable with your presence, you can watch them forage around and see the types of prey that they go for. These beetles have about as much behavioral charisma of any insect group I've studied. They are just plain fun to watch. Thanks, Ted. I'll keep an eye on that hole. I agree that these beetles were fun to watch. There was a lot of chasing and what looked like posturing and a bobbing of the abdomen that I assumed to be some type of communication. I'll keep watching. Lovely photos, and great info, Steve. Ted's got me on the lookout for tigers up here in the north, hopefully I'll have the same luck you did! Thanks, TGIQ. If they're up there, I'm sure you'll find them. I'll be watching for your success.